Here we are, 2010 at last! Out with the old and in with the new. Well, maybe not out with all the old, since www.globtopwhiskies.com and westernbittersnews.com, both upstarts in 2009, are soaring along with ever increasing interest and support. In the spirit of furthering the western collecting fraternity, I'm pleased to introduce the Western Whiskey Tooled Top Gazette. This site has been created with the intent of complimenting the aforementioned blogs. This site will serve to pick up the western whiskey saga where the glop top whiskies left off and to tie in the bitters products produced by the western liquor industry during the tooled top era. I'd like to reinforce that this will be a fun site. Let's keep it positive and enjoyable to both read and contribute to. On that note; Let's take a brief tour of where tool top western whiskey collecting began, where it has been and where it may be headed. Most will agree that this segment of the hobby began in the 1950's. Back then, folks didn't dig or buy, they "bottle hunted". Yep, walk though the forest where turn of the century logging camps once stood, poke through the sage brush amongst mining camp ruins in the Nevada dessert, paw through the garbage piles of abandoned homesteads in the Central Valley and pick up whatever struck your fancy. Color was king back then, as well as now. Only then it was a different kind of color; purple. Not nuked purple mind you, we're talking sun colored purple. Yep, those purple whiskies were "rare". It had taken almost a hundred summers to turn that color. Heck those brown ones were everywhere. Back then you had to trade a half dozen brown ones for one purple one. Embossing, who cared, they most all had writing, but not many were purple. The first decade or so was pretty much status quo; "The Age of Innocence". horses, eagles, bears, and people. By 1967 folks were starting to become a little more aware of what was, and what wasn't easily found. 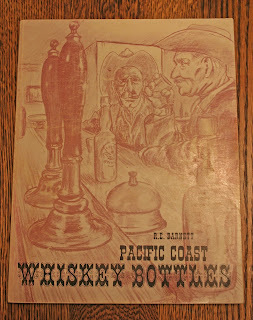 A fella named John Howe, came out with the first true western whiskey book that year. 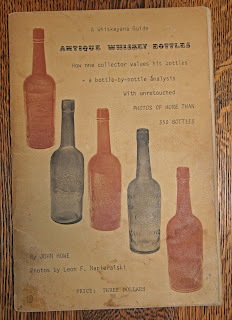 It was called Antique Whiskey Bottles, was softbound, had 68 black and white pages - about half with photographs and listed around 250 whiskies. Rarity was scored in terms of common to extremely rare and no prices were listed; it was a start. The hobby had begun to evolve. 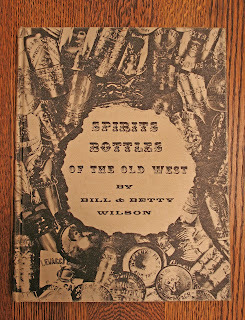 In 1968, Bill and Betty Wilson came out with Spirits Bottles of the Old West. Published in both hard and softbound, it contained 180 pages of photos, historical data, dating and information previously unpublished. It was as close to a research text as had been published to date; however it too lacked pricing. The next decade saw the hobby evolve and prices began to become standardized based on what the "market" would support. It also saw the beginning of the decline of easy finds and digging became more of a challenge and less of a sure thing. The supply was beginning to dry up and collectors were now having use a silver pick (wallet) as much as a garden shovel or potatoe rake in order to add to their collections. too, are the days of legal digging in many areas of the west, be it on "public" or private property. Demand has far outdistanced the supply of the better tool tops and there's no "cure" in sight. Common is, and will remain, common. Short of someone cornering the market on say, #202 neatly made Crown Distilleries, and then making a concerted effort to destroy all but a handful, they will remain a $10~ - $15~ bottle; in line with where they were back when greenbacks first began to be exchanged for glass. If not for common tool tops though, I, and many others, could not have afforded to enter the hobby and remain avid collectors as financial circumstances improved. This aspect of collecting has remained unchanged for the past 40 years. I suspect that it will continue to remain unchanged for the next 40. Simply, rarity equals demand and demand equals value. Both common and rare bottles continue to serve a purpose. I personally see a bright future for tool top western whiskey collecting . It will continue to evolve and change, as everything in life does, and I believe that we will continue to see new collectors enter the hobby and fill the voids left as the older ones pass on. The key to making sure that the hobby continues to thrive and grow is honest, forthright dealing, the willingness to share information, to remember how we felt as newcomers and to treat new collectors with the respect and enthusiasm that we were many years ago. Rose tinted glasses? Nope just common sense and experience talking. Great New Site . Let me be the first to say so . Thanks, Bruce, for placing a well deserved spotlight on the often maligned tooled top whiskey. I enjoy digging them every bit as much as the older ones. Not every pit has a whiskey in it, let alone a "globby" one. I will be contributing to your Blog from time to time and will be taking a look every day. Great job Bruce, your expertise on the subject and your writing style will make this a homerun! 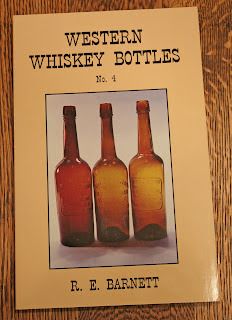 This adds another great site for collectors of whiskey bottles and western bottles in general. "Let the fun begin"!! I, being a tooled collector am estatic about this site! way to go! Did you know that the Jesse that's pictured # 568 in Barnett's book has 5 different molds in the tooled top version and what about #573 there is 6 different molds of that bottle. I picked up this habit studing Hostetters. Sign me up to post from time to time. What happened to the activity here? Don't let this site die from lack of interest.